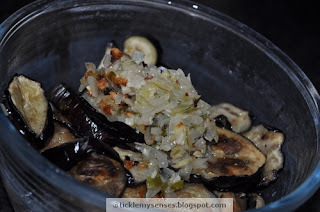 Tickle My Senses: Mangalore Style- Coconut-ey Brinjal Salad. 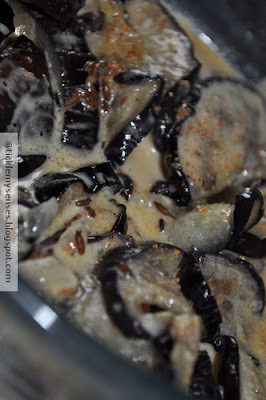 The smokiness of the roasted brinjals and the creaminess of the coconut milk make this salad melt-in-the mouth or simply delish. A dish thats not to be missed. I first tasted this exotic salad at Aunty Betty Sequeira's house in Mangalore, India. She is an awesome cook and makes such palate pleasing dishes, that everyone wants to learn to cook from her. At her diamond wedding anniversary a couple of years ago, she came out with a lovely collection of treasured Mangalorean and Kerala recipes in a compact cook book, of which she gifted me a copy. Thankyou Aunty Betty, will always treasure these recipes. 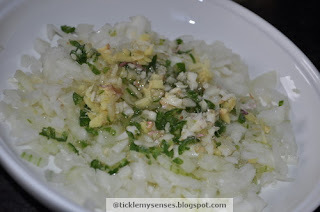 I have adapted this recipe from aunty's cook book. Making this salad takes quite a bit of time and effort, but believe you me, your taste buds will dance with every morsel of its glorious and silken goodness. 1. 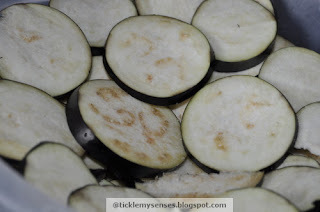 Wash and cut brinjals into 1½ inch slices. 2. Place a few slices of brinjals in a single layer in a colander, sprinkle a little salt over them, continue with the remaining slices using about 1 level tablespoon of salt in total. Now put a plate on top of the brinjal layers and weigh them down with a vessel filled with water or anything heavy, then put another plate underneath to catch the juices. Leave them like this for 30 mins- 1 hour. 3. Pre-heat the oven to 200C/ 375F. 4. 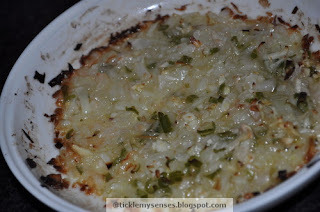 Finely chop onions, chillies, ginger garlic, place in an oven proof bowl. Pour over 1-2 tbsp oil, sprinkle over salt to taste, mix well with spoon. 5. 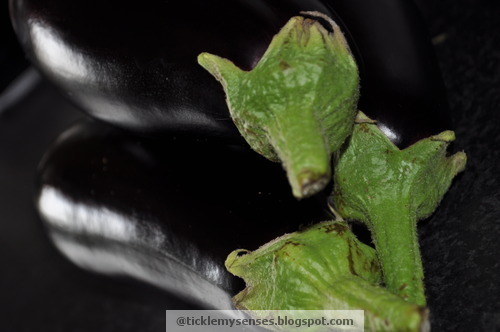 Next prepare the brinjals, squeeze out any of the excess juice from the brinjals with your hands and dry them as thoroughly as you can using a clean cloth. Next, spread them out on a baking sheet, drizzle 2- 3 tablespoon of the oil over them and toss them around to get a good coating of oil. 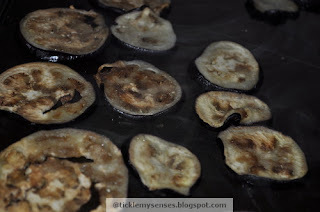 *If you wish to make this on a stove top then simply shallow fry few slices of brinjals at a time in a non stick pan, till done. 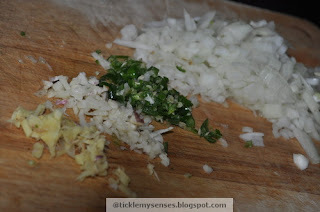 Seperately fry the onion, green chilli mixture till onions are softened. 7. While the brinjals are cooking heat 2 tsps of oil in a vessel, when hot add cumin seeds, when they splutter add, mangalore stew powder/ or your choice of spice powder and immediately pour in coconut milk. Bring the coconut milk to gentle boil on a medium flame. Taste for salt turn off gas. 8. Once the brinjals and onion mixture is done , take them out of the oven. 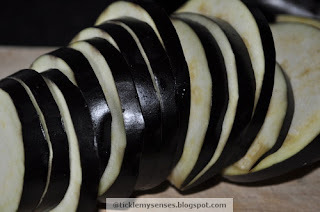 Place the cooked brinjal slices and the onion mixture into a single serving bowl. Mix well using a spoon. 9. 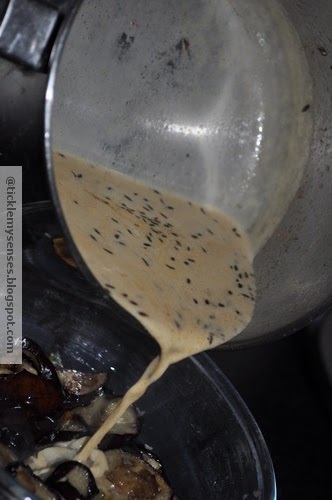 Pour the prepared spiced coconut milk over the brinjal mixture. 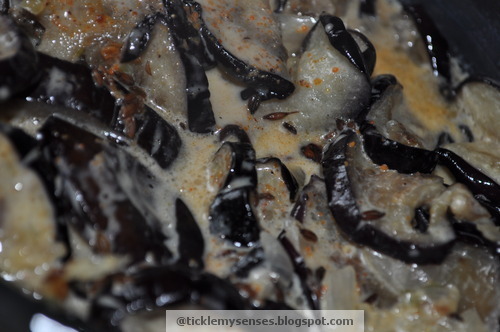 Set aside for a few minutes to allow the spiced coconut milk to work its way through the brinjals. Serve hot or cold. An excellent accompaniment to any vegetable pulao or chappatis/naans. Hi Aarthi....thanks for stopping by........will do!! you've mentioned 1/2 can coconut milk. Approx how many ml is that? Hi Soraya......sincere apologies for not getting back earlier, been busy with easter. 1/2 can is 120ml of coconut milk. Have a lovely easter!